All outdoor boots and shoes were made from leather in the 19th century, and as such needed polishing to keep them clean. Until the end of the century, shoes were generally made to measure, and the expense involved in having shoes made meant that they had to be kept in very good condition. When not being worn they were filled with paper to preserve their shape, and linseed oil was often rubbed into the leather to keep it smooth. This particular brand of shoe-polish has a racially suspect name. 'Nubia' was the name given by early French explorers to the region of north-eastern Africa around the huge Nile valley; 'Nubians' were by definition this area's inhabitant. 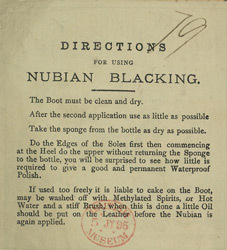 While the word 'Nubian' clearly has always had racial connotations, by the 19th century some of these connotations were outright racist: Nubian was now a slang word in English meaning 'black slave'.